Whatever you choose to call it, periods are dreadful. During 5th grade, I remember hearing whispers from my classmates about the horrors of getting your period and learning about all the wonders of puberty. However, for a long time, talking about something that was a natural occurrence in the human body was considered taboo. At first, I didn’t understand why my mother or anyone older than myself would refuse to answer my questions. It wasn’t until my brother started to complain about why I didn’t pray or when my father yelled at me asking why I wasn’t praying that I had the strongest urge to just yell, “I’m on my period!” but instead I would desperately look at my mother to make an excuse for me. That was when I started to feel ashamed about going through something that most women go through. 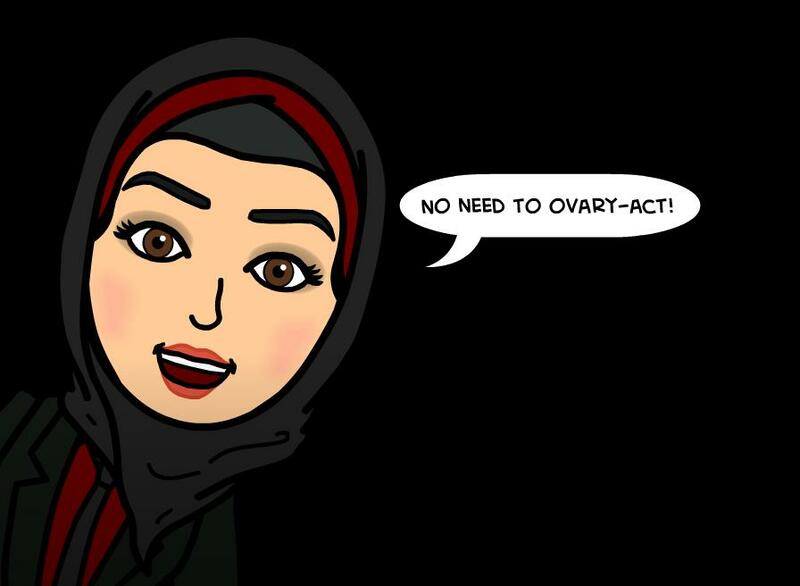 Then about three years ago, someone approached me asking what Islam says about menstruation. My only response to this issue was learning that I couldn’t pray or fast while I was on it. I couldn’t touch the Qur’an either. But I didn’t really know why these restrictions were put on women their periods. After countless hours of research of my own, I stumbled upon this verse from the Qur’an in Surah Al-Baqarah. This verse can be seen as very sexist in terms of the behavior they describe when dealing with women on their periods or a wife on her period. But when speaking about periods being “a harm” it is actually saying that it is harmful for the WOMEN, not the men. We all know how painful periods can be, am I right? The headaches, nausea, cramps, bloating and all that fun stuff. But my friend, Safaa B. puts it very eloquently. We see that Islam’s perspective is that menstruation is normal and it is natural, it is not considered as a “punishment” on women. There is nothing in Islam that says menstruating women are ‘dirty.’ Rather, menstruation is viewed as a natural process women experience throughout their lifetime. Verse 2:222 of Surat Al-Baqarah is not implying women can’t “pray” when they’re menstruating; they can still ask things of God, make du’a, and do dhikr. The motions of prayer, which is entirely different, are not permitted, because in order to pray Salaat, you need wudhu (ablution), and blood invalidates wudhu. So bleeding from anywhere continuously invalidates it, even from a wound or a cut. So in theory, blood is considered impure, not menstruation itself. Now, what can you do to help yourself during this time of the month? Drink lots of water! Keep yourself hydrated. Use a heating pad to help with the cramps! If you don’t have a heating pad, fill a sock with rice, then tie the end with a rubber band and heat it in the microwave for 10-20 seconds! It will retain heat and easy to place on your body! Stock up on advil/midol to relieve your pain! Stay active if you can! Bananas have been known to help with cramps! Always remember to clean yourself to avoid any messes and keep good hygiene! Since we are excused from praying, what can we do to stay close to God? Do Dhikr! Bust out those prayer beads. Read up on your Islamic history! What tips and advice do you have to offer? Share in the comments! Very well said, and hit all the points for why Islam isn’t being sexist but pardoning women. And to be honest I never thought of it as denying women the right to pray, because you can still make dua just not namaaz. I liked the example between general bleeding invalidating wudu i.e. cuts that apply to all genders so it gives a better understanding to males and even to non-muslims themselves. Thank you so much Mina! I agree, I feel like many women and young girls don’t know this and even muslims in general so they treat it like it’s taboo! I like this article very much and i am glad that you have written it. However, i would like to touch upon your point about being unable to touch the Quran. I am unsure if this is a school of thought issue or not, but i was also raised on the belief that women cannot touch the Quran while menstruating. However, i recently learned that touching the Quran, and even reading it, is permissible for menstruating women. I am confused and it seems like there are different sources telling me different things. Ainee, what do you think? The picture on this article is so freaking amazing. It was made from a site called Bitstrips. It’s like if you’re sick and someone tells you to stay home from work or school…Is that person denying you an education or a salary? Uhhh…No! They want you to rest and get better. just to know ordinary bleeding from wound for example isn’t impure only menstruation one’s. Unlike you, Allah (SWT) does not hate women. He is the Most Gracious, Most Merciful. The crap you are currently spewing is very Original Sin-esque, which just shows how much of a misunderstanding you have of the place of the woman in Islam because there is NO room for misogyny or shaming of women for a bodily function bestowed on us by our Creator in our faith. And if we do have “power” over you, maybe you ought to show at least a tiny scrap of respect for us.